There is so much, in the following pages, likely to offend conventional theories as to what is possible, or credible, that I look forward very confidently to the mockery with which the narrative will be assailed by writers who assume the resources of Nature confined within the limits of their own experience, and the powers to which humanity can attain, measured by the standard of a college examination. All around us, even in London, and at the present day, psychic phenomena that transcend this view of things are of constant occurrence, and lie within the personal knowledge of hundreds of people, - we might say of thousands, taking the whole country into account Large groups and societies of such people meet together and laugh, or grieve, as the case may be, over the perversity of the ignorant multitude who vainly and foolishly imagine themselves the vanguard of civilisation and culture, while scornfully holding aloof from the knowledge which, though but just dawning on our generation, is manifestly, for all who can appreciate it, the most sublime to which human intelligence can be directed. 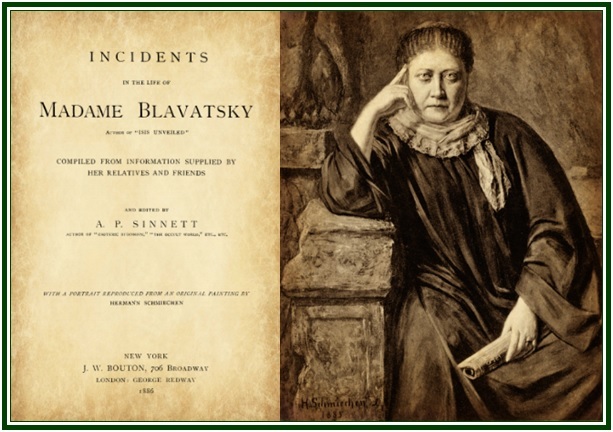 The book “Incidents in the Life of Madame Blavatsky” was published in our associated websites on 20 January 2019. Life includes paradoxes, and while the title of this good book by A. P. Sinnett includes the expression “Madame Blavatsky”, our readers can see HPB’s own opinion and testimony about being called a Madame - or a Countess. Click and read the text “Why HPB Was Not a Madame”. See also the book “Esoteric Buddhism”, by A.P. Sinnett.